Synthetic peptide conjugated to KLH derived from within residues 1 - 100 of Human RPS6. This antibody gave a positive signal in the following whole cell lysates; HeLa (Human epithelial carcinoma cell line) Jurkat (Human T cell lymphoblast-like cell line) A431 (Human epithelial carcinoma cell line) HEK293 (Human embryonic kidney cell line) HepG2 (Human hepatocellular liver carcinoma cell line) MCF7 (Human breast adenocarcinoma cell line) SHSY-5Y (Human neuroblastoma cell line) IHC-P: FFPE human skin melanoma tissue sections. Our Abpromise guarantee covers the use of ab40820 in the following tested applications. WB Use a concentration of 1 µg/ml. Detects a band of approximately 31 kDa (predicted molecular weight: 28 kDa). Western blot - Anti-RPS6 antibody (ab40820)This image is courtesy of an Abreview submitted by Antibody Solutions Ltd.
IHC image of RPS6 staining in a section of formalin-fixed paraffin-embedded normal human skin melanoma* performed on a Leica BONDTM system using the standard protocol F. The section was pre-treated using heat mediated antigen retrieval with sodium citrate buffer (pH6, epitope retrieval solution 1) for 20mins. The section was then incubated with ab40820, 5ug/ml, for 15 mins at room temperature and detected using an HRP conjugated compact polymer system. DAB was used as the chromogen. The section was then counterstained with haematoxylin and mounted with DPX. 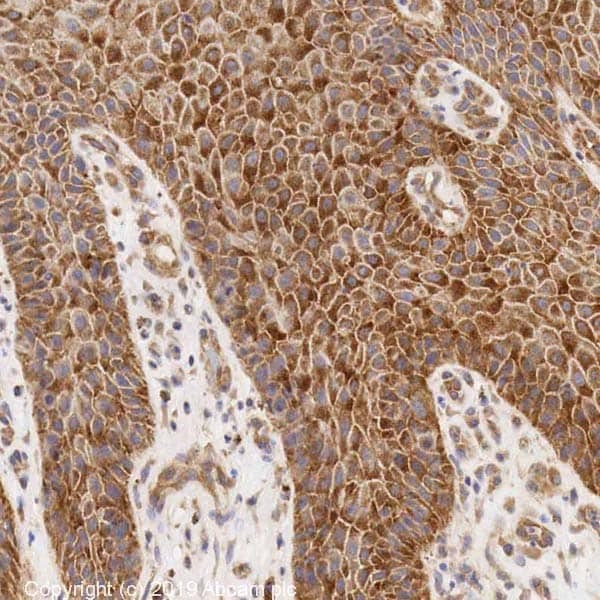 ICC/IF image of	ab40820	stained	DU145	cells. 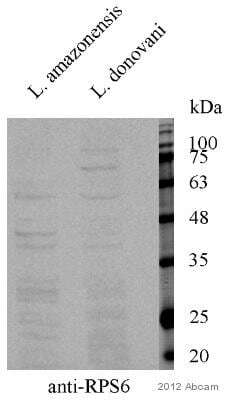 The cells were 100%	methanol	fixed	(5 min)	and then incubated in 1%BSA / 10% normal	goat	serum / 0.3M glycine in 0.1% PBS-Tween for 1h to permeabilise the cells and block non-specific protein-protein interactions. 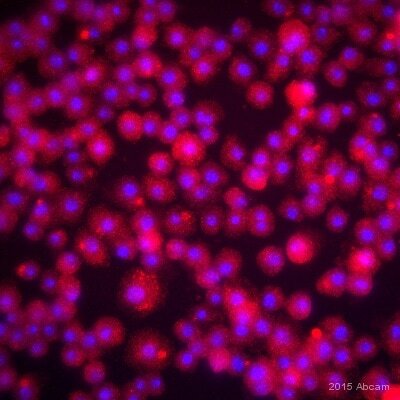 The cells were then incubated with the antibody	ab40820	at	5µg/ml	overnight at +4°C. 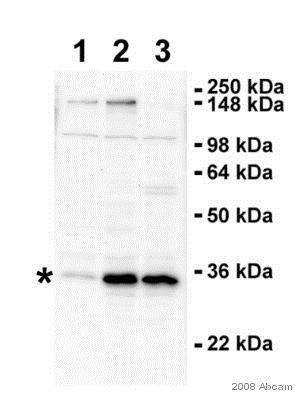 The secondary antibody (green) was DyLight® 488	goat	anti-	rabbit (ab96899)	IgG	(H+L) used at a 1/1000 dilution for 1h. Alexa Fluor® 594 WGA was used to label plasma membranes (red) at a 1/200 dilution for 1h. DAPI was used to stain the cell nuclei (blue) at a concentration of 1.43µM. Publishing research using ab40820? Please let us know so that we can cite the reference in this datasheet. Our customer is willing to test AB40820 in WB withLeishmania samples. Are you interested in this type of the information for the Abreview promotion? 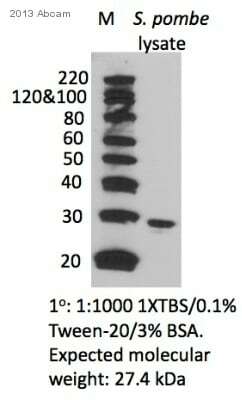 (The customer buys certain antibodies and upload Abreview on Abcam's website and then we give 100% credit note for this antibody to buy next antibody)? I am very pleased to hear you would like to accept our offer and test ab40820 in Leishmania samples. This code will give you: 1 free PRIMARY ANTIBODY OR VALUE OFF OF ORDER before the expiration date. To redeem this offer, please submit an Abreview for Leishmania samples and include this code in the “Additional Comments” section so we know the Abreview is for this promotion. Please remember that submission of the Abreview is sufficient for the discount code to become active.